If you seek the vacation or event of a lifetime, you’ve hit the bulls eye! Costa Rica is one of the world’s most amazing countries, Playa Tamarindo is its most fun beach town, Langosta Beach is Playa Tamarindo’s most exclusive neighborhood, and Casa de Luz offers the most upscale estate accommodations in town. For driving directions, skip to bottom of this page, use our Google Map Link, or access our Printable Directions. Costa Rica was named the #5 most desirable international destination for 2015 by Priceline – based on reservation requests, not opinions. It is also consistently rated “The Happiest Country On Earth” – the national greeting “pura vida” means “good life”. This country has been a stable democracy for generations with no internal strife and great social programs – and no army! And no currency controls or tourist visas needed for US citizens. 90% of the energy is renewable, Internet/cellular is cheap, and you can even drink the tap water or plug your US appliances in the wall. And of course, the beaches, jungles, volcanoes, and other attractions are legendary for good reason! Enjoy seeing monkeys and parrots…in fact the ultimate jungle tour often visits our pool at sunset! 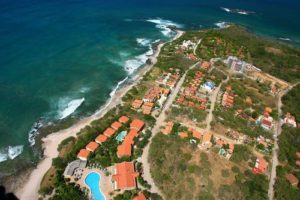 The most developed Pacific beach town on the famed “Gold Coast”, Tamarindo is large enough to offer anything you want, but intimate enough to make friends with the locals everywhere you go. And, it was named one of TripAdvisor’s Top-10 Destinations in Central America for 2015. 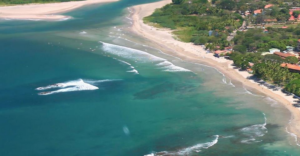 Playa Tamarindo offers world-famous surf breaks for beginners or experts, fine dining, dancing, a casino, and tours to more adventures than you could try in a month. It is located just over one hour from an International Airport (LIR), which is served non-stop from multiple US cities on several major airlines. Langosta Beach is Costa Rica’s top destination wedding beach, and a world-famous surfing beach. It serves as “the Beverly Hills of Tamarindo”, offering upscale and secluded accommodations just 5 minutes drive from the bustle of downtown. Langosta Beach features “Millionaire Row”, a strip of 12 mansions along the beach well known as the most desirable homes in the area. Casa de Luz is the only estate on Millionaire Row built on 2 full beachfront lots, so it offers the only mansion where every single room directly faces the beautiful sea sunsets. Bulls eye – you have zoomed into the ultimate destination for the vacation or special event of your life. Now, how do you get there? First, we recommend flying into the Daniel Oduber International Airport in Liberia (LIR), which is served non-stop by Delta, American, United, Alaska and others from multiple US cities. More airlines/cities are regularly added. LIR is just an hour drive from Casa de Luz, while Costa Rica’s main airport in San Jose is a grueling 4-5 hour drive. Below are directions from LIR, and a printable version is available here. For directions from San Jose or other Costa Rica locations, please contact our office or your concierge, or use our Google map link. From Liberia Airport, turn right onto the main road. If you are coming from San Jose, you can get directions to LIR and continue on this route. Once you arrive in Belen (6), turn right following the signs to Tamarindo (and other beaches such as Flamingo). Keep going until you hit a T in the small town of Santa Ana (7). Turn left staying on the paved road (if you go right there is on a dirt road). Keep going, and you will pass Gas Station Oasis and then over some hills. The next town is Huacas (8). Keep going straight until you see signs to Tamarindo – turn left. Keep going straight until the next town Villareal (9) where there are signs to Tamarindo – turn right. You will pass two short blocks of restaurants and shops on either side before reaching a fork in the main road. Veer right onto Calle Cardinal towards Langosta, which becomes unpaved (but well maintained). Follow this road about a mile to Langosta where you’ll reach another fork. Again stay right, and immediately a multistory commercial building is on the left. Continue straight until you see two large 7-story condo buildings on your left side. Pass these and take your next right onto the beachfront road, where Casa de Luz is located! The neighbors call this loop road Calle Guapinol, but Google calls it Calle Cantabria. Take your pick – in Costa Rica, street signs are rare, and street numbers nearly unheard of. Casa de Luz is almost at the end of the line of beach estates, see left (immediately before Sueno de Mar B&B, and 3 properties before a multi-story condo building called Crystal Sands). Our name is on a sign in the front walk-in entry in large letters to welcome you.